Preheat oven to 180°C (350°F). Place the coriander, cumin and fennel seeds in a small frying pan over high heat and toast for 30 seconds. Place the mixture in a food processor, add the ginger, garlic, sugar, tomato paste, grated beetroot, onion, coriander, chilli, salt and pepper and process until a fine paste forms. Heat 2 tablespoons of the oil in a large ovenproof saucepan over high heat. Sprinkle the beef with salt and pepper and cook, in two batches, for 5 minutes or until well browned. Remove the beef from the pan. Add the curry paste to the pan and cook, stirring, for 3 minutes. Return the beef to the pan, add the water, bring to the boil and cover with a lid. Place in the oven and cook for 1 hour. 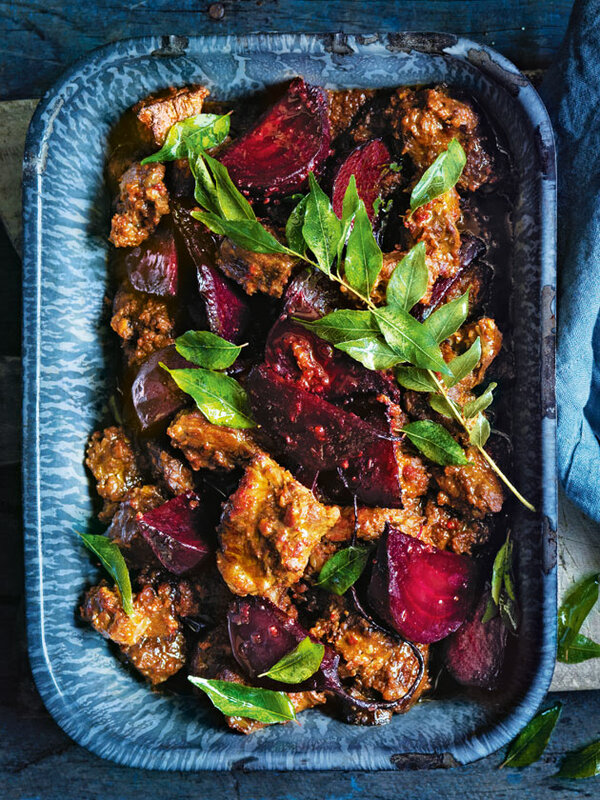 Add the beetroot wedges, cover and cook for 30 minutes. Remove the lid and cook for a further 45 minutes. Heat the remaining oil in a small frying pan over high heat. Add the curry leaves and cook for 30 seconds or until crisp. Top the curry with the fried leaves and serve with the yoghurt and roti. Serves 4.